Oddly enough it is not unusual to assign a group of people a task and to say: “now you are a team.” We all know that to call a group a team doesn‘t make it work like one. In my practice as a team coach, I see that actually most groups do not function as a team. But what do they do instead? Not every group of people that work together is a automatically a team. Although it may be a matter of semantics, it is certainly not trivial. Belonging to a group of hard working individuals in which everyone says it should be a ‘team’, but not experiencing it as such spells frustration. Team goals and team rules are discussed on off-sites, resulting in no direct improvement of team results. Or, the team engages in cooking classes and night drops. The next day, at the workplace, everyone’s in great spirits, but there is still no team. Other teams like to take up a challenge and see the need to achieve a greater degree of interdependence. They want to be a ‘real’ team and thus need to be willing to grant other colleagues access to their garden. If team members dare to give up individual autonomy, an important condition for teamwork is met. The will, rather than the obligation to be a team, is what creates real team spirit. From here on the team may evolve into a self-guided team and – who knows – into a high-performance team. This is my version of a model of Katzenbach & Smith, who explain the stages slightly differently. In my view they erroneously call the responsible task team a ‘potential team’ and a self-managing team a ‘real team’. I prefer to avoid calling one type of co-operation superior to the other. Every type of co-operation can be most effective in its own, specific task-work environment. The T0 stage is not ‘just’ a collection of unrelated individuals. It can be a closely tight community of colleagues who have known each other for years and care for each other. T0 – Community Garden team. Collegiality is key and people sustain a good working atmosphere. They share information, learn together and take each other’s watch. This can absolutely feel like a team, but in my definition it is not. Everyone sits on their own piece of land, and that’s usually just fine. In healthy, professional teams, the individual can rise to great heights. T2 – Self-guided team. Now the team will add entrepreneurship. Members are taking initiative and show responsibility for the total. Initially in subgroups that take up a task (such as organizing the annual conference). Then the team as a whole will start making their own decisions. The team is accountable towards the environment and each other. 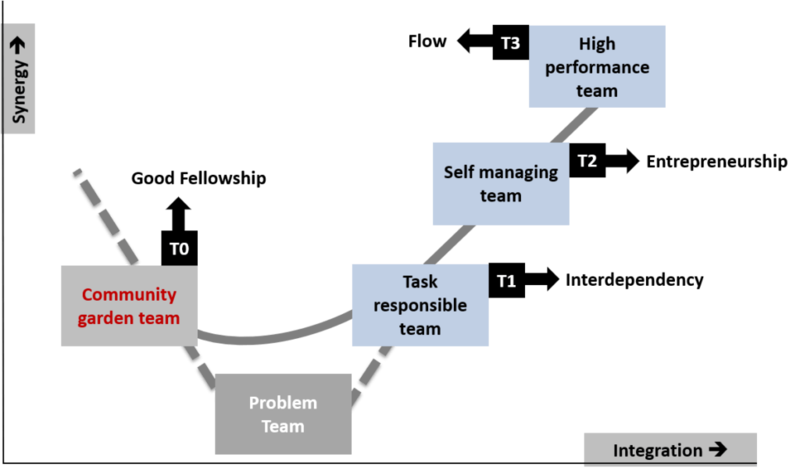 T3 – High Performance team. In my workshops not many say they have experienced this. And when they do, it was in sports and typically just temporarily. This type of team is in ‘flow’, and team members simply need half a word to communicate. They complement each other naturally. It feels as if ‘rising above yourself’. We call this: synergy. To accomplish this, ego must go. T1 – Task Responsible team. Here one recognizes interdependence and tasks are becoming more integrated. The aim is to connect and multiply. This should be a deliberate choice of the team members, not just of the manager. To make this leap requires learning and development. The group will mature and acquire interdependent work routines.